A child who is a pet lover may be super excited about taking on dog-walking jobs. Children under 14 have limited employment opportunities, and dog walking may be one of the few avenues of work available to them. Just as pet-sitting jobs have their pros and cons, though, so do dog-walking jobs. Explore some of the features of this work opportunity for your child, because who knows? That dog-walking youngster may one day become a veterinarian, open up a grooming business, run an animal shelter, or take on some other related business or career. Dog walking often pays more money than pet sitting and could become a regular job for your child if she bonds with the right four-legged client. Because dogs are very common household pets, your child may easily find families in need of a dog walker. Kids can get started by telling friends and neighbors about their new dog-walking business. In addition, they may want to check with elderly people who have trouble walking their own pets. Dog walking makes a great job both during the summer and when school is in session. During the school year, your child can walk dogs as an after-school job. It's not only a fun way for kids and dogs to stay fit, but dog walking won't take up a large part of the afternoon and evening, leaving time for kids to complete schoolwork and participate in extracurricular activities. Dog walking is also an attractive option for kids because it doesn't require them to spend a lot of money to get started. They won't have to pay money for a uniform, for example. When starting out, kids would be wise to purchase a spare leash or harness for the dogs they walk, a good supply of plastic poop bags, and a water bottle and portable bowl to keep the pups hydrated. Unlike other jobs, dog walking can be appropriate for kids of various ages. Older kids can take on two different clients at once and walk them at the same time, allowing for double the income. 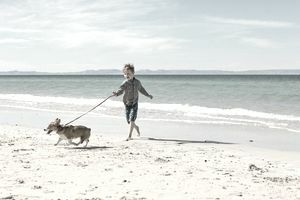 Children should walk dogs in well-lit and well-populated areas that they know well, keeping an eye out for aggressive dogs, fast-moving bicycles, and cars. When your child lands a new client, check to see whether the dog's size works for your child. A strong or heavy dog that can pull harder than your child can handle might create a problem when a squirrel, scooter, or skateboarder whizzes by. Dog walking is a lot of fun, but clients still expect children to be reliable. A child who walks dogs daily can't just call in sick. Fido will still need to get his walk in. Make sure your child has a friend or sibling lined up for emergencies, or else you might be stuck walking the dog. You'll also need to make sure your child knows that cleaning up after the dog poops is part of the job. Your child should always carry plastic bags to pick up dog poop and walk routes where there's at least one trash can in which to deposit the waste. Cleaning up poop isn't the only responsibility your child will have. Dog walking entails caring for a living creature, so he must understand the consequences of his actions when he is with the dog. Such responsibility means keeping dogs cool to prevent overheating in hot weather, keeping the dog on a leash at all times and not allowing it to run out onto the street, and giving other dogs and their owners a wide berth until they know both dogs are friendly. Because walks are so important for dogs, these animals may still need a walk when it's cold, snowing, or raining outside. It wouldn't hurt for kids to also know some basic first aid for dogs, too, such as understanding how to treat a dog that gets a bleeding cut on its paw. Dog walking might not be the right fit for every kid, but for animal lovers who can handle the responsibility, a daily dog-walking gig can teach kids plenty of good lessons. Responsibility, by caring for the dog and picking up after its "bathroom visits"
Kids should research how much they can charge for their dog-walking services. Some clients will offer your child a fixed payment, while others will ask how much she charges. She'll learn that prices fluctuate based on the client and the circumstances. You can help your child start researching by guiding them to the website Care.com, which can give them the going rate for dog walkers by zip code. They'll likely earn less than professional or certified dog walkers though, who charge anywhere from $15 to $30 per hour and can go as high as $50 per hour. Your child can also call around and get quotes from others who offer the service to determine the going rate in your area.